On July 6, 1947, the Avtomat Kalashnikova went into production by the Soviet Union, hence the name AK-47. Question for students: Have you ever wondered why this particular weapon became so popular throughout the world? The creator, Mikhail Kalashnikov was wounded in the Battle of Bryansk in 1941 and began to design the automatic rifle from his hospital bed. The AK-47 was officially adopted by the Soviets in 1949 as it quickly became standard issue in the Soviet Army. The AK-47 was simple to operate, rugged and reliable and was designed to be easy to mass produce. There are a few different elements of the AK-47 that you can look at to see why it was liked immediately by the Soviet Union and other members of the Warsaw Pact in 1949. The AK-47 was considered an extremely reliable weapon. While it didn’t have the accuracy that soldiers would rely on, the standard of quality that the AK-47 operated on quickly became standard for all guns across the Soviet Union. Any weapons that were not up to the standard of this firearm were immediately discarded. AK-47 Type 3A with ribbed stamped-steel magazine. Photograph by Ickybicky at en.wikipedia. AK-47’s are also simple to manufacture and even easier to use. They were reliable and rugged even through harsh environments which may be the reason it enjoyed a ride to popularity amongst the masses. The Type 2 AK-47 began manufacturing in 1949 which is when the Soviet Union accepted the weapon into their military as a standard issue weapon. The problem with the Type 1 AK-47 in 1947 was just related to the lack of efficiency it had in mass production. Another characteristic that contributed to its popularity and success involves the cartridge that it fires, the 7.62x39mm round. These rounds are cheap and easy to make which makes the AK-47 cost less for every time you pull the trigger. With the firearm itself able to withstand intense weather conditions and environments and the ammunition being cheap enough to stock up on it becomes easier to see what gave these guns rise to fame in the first place. The reliability also stretches a bit further when you get into the nitty gritty of it. The AK-47 is sealed to reduce the amount of dirt that can enter into the firearm. So if you took it out in the mud you can still expect it to fire when it really matters! You also don’t have to worry about smaller parts on this gun. It was made on a basis of large, easy to handle pieces so you never have to worry about groveling for lost pieces in the mud. The ease of disassembling this gun and the practicality of all its parts let it be an easily understood gun that any person, regardless of skill, was able to pick up and learn in a relatively short amount of time. Because the parts of the AK-47 were constructed with simplicity in mind the guns themselves are also easy for you to repair! As you continue through here you can understand why the soldiers of the Soviet Union had such high demand for this gun. It gave them a reliable, long-lasting, easy to fix and cheap to fire option that they thought they could rely on with their life. With all of these parts in mind, you can see that the government of Russia pushed the manufacturing of these firearms. They had a widespread availability from this manufacturing push and the standard of quality kept the demand up right along with them. 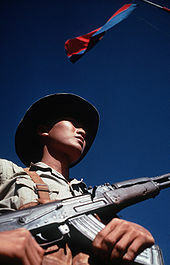 Việt Cộng soldier armed with an AK-47, standing beneath the flag of the National Liberation Front of South Vietnam. Photograph by SSgt. Herman Kokojan. The AK-47 represented a blend of choices that had not been done before. The medium sized round that it fired was not powerful enough to be used successfully in any sniping circumstances but it would definitely cause damage at close ranges. Trench warfare was already well within use from World War I and the AK-47 was designed specifically for defense at ranges where most combat statistically happened anyways. It also earned the respect of the American army in the Vietnam War and held its own vs the M16. Soldiers would later complain that the M16 was prone to jamming and didn’t compare to the reliability of the AK-47. They realized that a single guerilla using an AK-47 could slow down a company. They would dodge in and out of ruins to harass the aggressive squad to allow the rest of their own squad to escape. The gun grew in popularity and has had different variations made of the original model. There are somewhere between 75 million and 100 million variants rumored to have been made across the world. The world currently shows 875 million firearms are in global circulation. The numbers there show how popular the gun became as all the elements of a gun that served the soldiers needs came together to form the AK-47. As the years went by the AK-47 slowly became an icon of military strength and keen simplicity. It won its title as the most popular assault rifle through its impressive success rates and continued performance in intense circumstances. It was initially created by Kalashnikov to defend his homeland, Russia, against the imminent invasion at the time. As his time passed by he made comments that states his regret towards seeing his design become a tool used by terrorists in modern times. The AK-47 brings a lot to the table to consider on why it became so popular. It has durability, reliability, high level of functionality combined with simplicity. With all the pieces to be more standard and less unique in quality allowed factories to be able to mass produce the weapon into the fame that it enjoys today. You may have known that there were a lot in circulation already but now you know why. Soldiers created a high demand for this gun because they could rely on it with their life. Well, at least better than they could with any other gun. Vorobiev, Marco. AK-47 – Survival and Evolution of the World’s Most Prolific Gun. Gun Digest Books, 2018. The featured image in this article, Mikhail Kalashnikov on a 2014 stamp of the Russian Post, is not an object of copyright according to article 1259 of Book IV of the Civil Code of the Russian Federation No. 230-FZ of December 18, 2006. Next Article March 1, 1986: Prime Minister of Sweden Assassinated, Crime Never Solved!